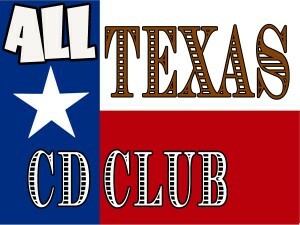 TEXAS CD CLUB! - ALL TEXAS MUSIC- SUPPORTING DIVERSE TEXAS MUSIC! Music Store, CD, Vinyl, Satellite, Web Radio and MUCH more! The Best Little Website In Texas! The All Texas Music CD Club is for people who love ALL the different kinds of music coming out of Texas! We send you a CD each month! It’s like Christmas surprise every month of the year! Join Today for yourself, or for a great gift to a great person! What kind of music? That is the treat! You might receive a CD from any genre of music, but it all comes from TEXAS musicians. It could be Country, Rock, Ambient, Blues, Folk – it is always a surprise and fun to see what you may get! And, for some, it might open your exposure up to a new kind of music! It’s fun, and it helps to support a Texas Musician each and every month. This is very important to help a struggling artist who may only be getting $1 a month from a lousy MP3 download. Plus – Club members get surprise gifts too! If the CD is an out of print or rarity item, we will reserve the right to send you our own special edition from our specially acquired collection of master recordings.